For all you non-Australian folk out there, Dreamtime refers to a religious, cultural, and mythological worldview which is generally characterized by ancient Australian Aboriginal beliefs. The term was coined by early anthropologists to explain “The Dreaming” which is used to represent Aboriginal concepts for mythical time or “time out of time”. The Aborigines thought that during this time, the sacred land was inhabited by their heroes and ancestors which were believed to possess supernatural abilities. We should know that this magical Dreamtime has now become a cultural phenomenon and an important part in global pop-culture, bewildering and charming tourists and natives alike. It is represented through many symbols and mainly red and yellow colors. The Ezycaps Dreamtime Cap has this covered. Is there any better ways to honor the ancestors while looking good at the same time? We offer cultural appreciation through this distinctive headwear which will guarantee to stand out among the most stylish of caps. 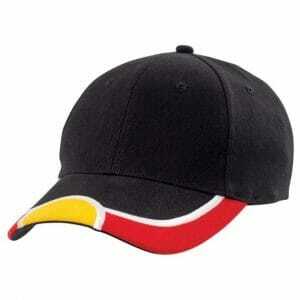 The Dreamtime Cap can be embroidered and is available for many printing ideas you may have. Superb for promotional customization, personal uses, or sheer marketing ideas, your company’s logo will be featured on a symbolic cultural item which honors the legends of the ancestors. With a very versatile material and stylish texture, the cap lends itself to indigenous-themed events and cultural manifestations of its kind. It is best if you show your support and appreciation or simply show your support to our indigenous first settlers. When one requires proper headwear, look no further than the almighty 6-panel cap design. A standard classic cap of our time, the Velcro fastener, the semi-circular peak, and the padded cotton sweatband all make it one of the best choices you can make when it comes to buying headwear. It is worth mentioning that the sizable cap is perfect for printing and stitching any promotional and marketing logo idea you might have for your company or business. The Ezycaps Dreamtime Cap is characterized by embroidered eyelets, an adjustable strap, a structured 6-panel design, and a pre-curved peak which is quite comfy. The heavy-brushed cotton makes it worthwhile, and the Ezycaps Dreamtime Cap comes in black, red, and gold colours, representing the sacred Dreamtime colours. The white embroidery edging is also available, and a logo of your choice of course. Typically, the cap also utilizes logos for companies, businesses, and any other types of logos you wish to have printed on the side. The padded sweatband and 100% polyester material make sure the cap is durable and flexible enough for any wearer, while the five-structured panel design and Velcro fastener ensure stability and comfort. Great for outdoors, the Ezycaps Dreamtime Branded Cap is a soft cap with a stiff bill eye-shade in front and a rounded crown for all head sizes. The cap can effortlessly fit to the wearer’s head size, as the back side provides flexibility. The main promotional feature is that the baseball cap can also be used for printing any logos or pictures on the cap’s surface. The Ezycaps Dreamtime Cap is the perfect headwear for honoring the sacred Aboriginal tradition with an urban style.